A job with a promising future goes a long way toward making you happy — at work and at home. Do you know of the fine opportunities for advancement that are available in the plastics industry? Do you want to share in the development of a great new plastics era? 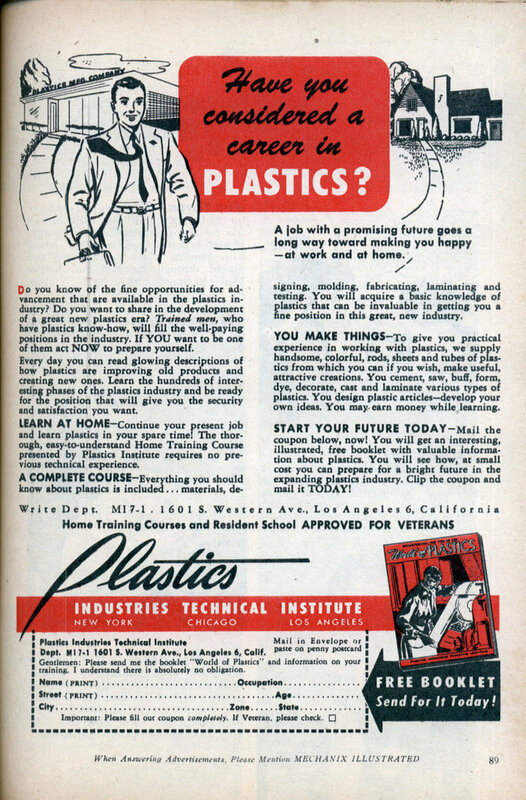 Trained men, who have plastics know-how, will fill the well-paying positions in the industry. If YOU want to be one of them act NOW to prepare yourself. 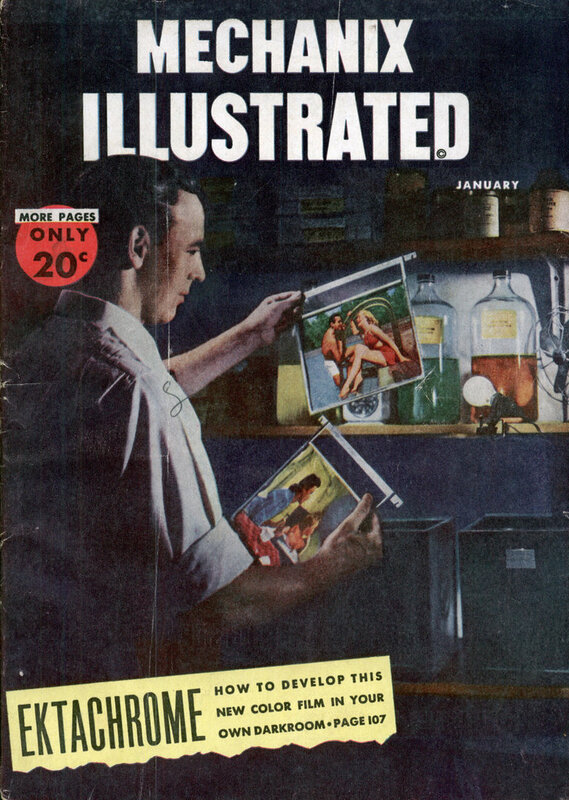 Every day you can read glowing descriptions of how plastics are improving old products and creating new ones. Learn the hundreds of interesting phases of the plastics industry and be ready for the position that will give you the security and satisfaction you want. LEARN AT HOME “Continue your present job and learn plastics in your spare time! The thorough, easy-to-understand Home Training Course presented by Plastics Institute requires no previous technical experience. A COMPLETE COURSE-Everything you should know about plastics is included … materials, de- signing, molding, fabricating, laminating and testing. You will acquire a basic knowledge of Plasties that can be invaluable in getting you a fine position in this great, new industry. YOU MAKE THINGS-To give you practical experience in working with plastics, we supply handsome, colorful, rods, sheets and tubes of plastics from which you can if you wish, make useful, attractive creations. You cement, saw, buff, form, dye, decorate, cast and laminate various types of plastics. You design plastic articles—develop your own ideas. You may earn money while learning. START YOUR FUTURE TODAY-Mail the coupon below, now! You will get an interesting, illustrated, free booklet with valuable information about plastics. You will see how, at small cost you can prepare for a bright future in the expanding plastics industry. Clip the coupon and mail it TODAY! Dept. MI 7-1 1601 S. Western Ave., Los Angeles 6, Calif.
FREE BOOKLET Send For It Today! One word, just one word. Plankton-sized bits of plastic float just below the surface of the ocean in wide-ranging masses some say as far and wide as two times the size of Texas. They outnumber plankton in the North Pacific Gyre and scientists say that there’s no way to clean it up. About 44 percent of all seabirds eat plastic, apparently by mistake, sometimes with fatal effects. And 267 marine species are affected by plastic garbage from swallowing plastic bags, which resemble jellyfish in mid-ocean, for one example, this according to a 2008 study in the journal Environmental Research by oceanographer and chemist Charles Moore, of the Algalita Marine Research Foundation. Plastic breaks down and releases toxins such as styrene trimer, a polystyrene by-product — a known carcinogenic — and bisphenol A, which interferes with animals’ reproductive systems. The plastic pieces themselves are a million times more toxic than sea water. “Plastics” was a word back then that meant endless opportunity for personal growth and I believe it still means that. If we take on the job of saving our oceans by recycling (less than 5% recycle worldwide), and using our human ingenuity to invent new, sustainable ways to contain goods, container makers will great new jobs, new revenues and we can, together, save ourselves from our folly borne out of an ancient petroleum based industry. You will note that they are looking for trained men. These are the guys who later will become Top Men. Mitch » Unfortunately that took place 11 years before this article. Nice effort though. Stop preaching. Most of your post was diatribe. Just do it. TomB: of course, you’re right. But, instead of disounting me with seeming disgust, I would honestly love to have you share what you are doing — please inspire me and others. Honestly, not meant in any other way but that. I burn all my plastic to make sure it doesn’t end up in the ocean. I thought the burning of plastic emits carbon-dioxide and harmful gases into the air? Lauri Burrier » He was kidding. Well, that’s so funny! And, yes, this is clearly a place where boys get together to make light. Shoving off now, sorry if I made any ripples on your pond. Ribbit! Lauri Burrier » And you know beyond a 50% chance someone with a screen name of Eamonn is a boy, how? peace! there are so many bigger problems on earth for us to attack together.